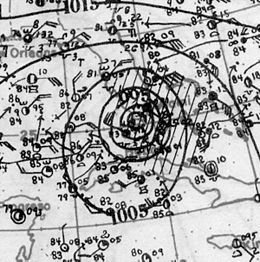 The 1926 Miami Hurricane (or the Great Miami Hurricane) was a very large and violent tropical cyclone. The hurricane caused a lot of damage in the Miami metropolitan area of southern Florida and in the Bahamas. The storm caused $78.5 million in damage to the United States. Estimates from 2010 put the damage at $165 billion, meaning the storm surpasses Katrina as the costliest U.S. hurricane. Between 372 and 540 deaths happened because of the hurricane. ↑ "Deadliest, Costliest and Most Intense Hurricanes 1851 to 2010" (PDF). NOAA. Retrieved Sep 18, 2016. This page was last changed on 1 August 2018, at 20:32.